New Delhi : The third day of Chaitra Navratri is dedicated to the worship of Goddess Chandraghanta, the third manifestation of Goddess Durga. Maa Chandraghanta Devi is called the Goddess of spiritual and internal power. Devotees believe that by worshiping her, they get rid of severe obstacles in life. Scroll down the page to know about Maa Chandraghanta, puja vidhi today, auspicious timing and aarti mantra to chant before the Goddess. Basically the married form of Goddess Parvati is worshipped on this day. Goddess Parvati is the wife to the almighty Lord Shiva. After a marriage Lord Shiva adorned the Goddesses forehead with a Chandra made from chandan. This is the reason due to which she is known as Chandraghanta. It is believed that she removes the problems and little demons of life. She has ten arms and three eyes, with Shiva’s crescent moon on her forehead. She has golden complexion and is ready for war. She wears a mala of bells which terrifies demons, as they attempt the silencing of bells, of articulation. She rides a tiger and protects her devotees, gives peace and bestows ultimate good.She holds a Gong (big bell) and adorned with half moon on head. 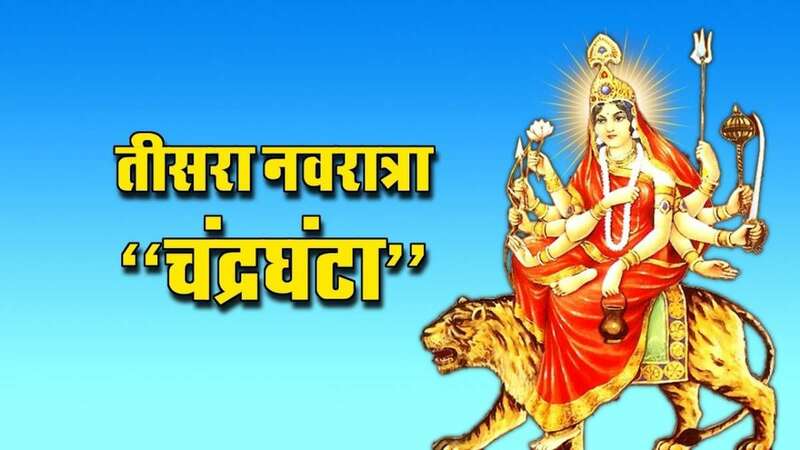 This chaitra navratri 2019, this auspicious puja falls on Monday, 8th April 2019. Chandraghanta Puja is performed on the Tritiya Tithi of Navratri Day.